On the night before his sailing ship, the Suva Star is to leave for Cocos Island on a treasure hunt, Captain Kane discusses the journey's sponsor, Miss Patience Nodbury, with Steve Daniels, who had helped to arrange the trip. 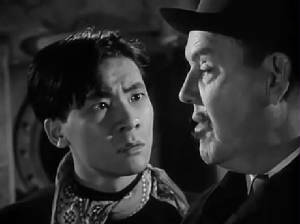 Charlie Chan, searching for his son, Jimmy, who is attempting to stow away in search of adventure, arrives. He meets Miss Nodbury who explains that she tore the treasure map, drawn by her pirate grandfather, Matthew Nodbury, known as Black Hook, into four pieces, and gave three of them to other passengers, adding that someone has tried to steal her portion of the map, causing her to delay the start of the trip. 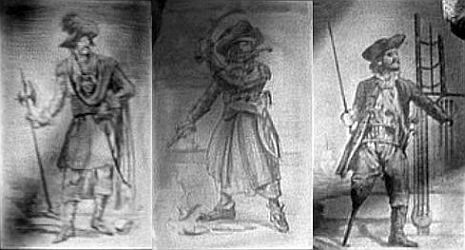 She goes on to tell Chan that Black Hook, who had a peg leg and a hook, appears to each Nodbury as they are about to die. Later, as Miss Nodbury retires to her cabin, she hears the approaching tap of Black Hook's peg leg and then the scratching of his hook upon her door. As the elderly woman opens the door, she sees her ancestor and dies of a heart attack. As Miss Nodbury lies dead on the floor, the pirate's hook snatches up her piece of the treasure map. Meanwhile, the ship's passengers, claiming that they have received a mysterious message from Steve Daniels, arrive and are introduced to Chan. They include Bill Lydig, a journalist about whom Chan is curious because he had heard that Lydig was dead, collector of rare coins Jed Thomasson, typist Kate Ransome, and newlyweds Charles and Laura Thursday. Kate discovers Miss Nodbury's body, after which Chan finds part of a Black Hook disguise that someone had worn to frighten the old woman to death. When Chan sends Jimmy ashore to call the police, the youngster overhears a suspicious conversation between Dr. Anne Bonney, a psychoanalyst, and her patient, Gene La Farge, who are both passengers aboard the Suva Star. Back on the ship, La Farge admits that he had seen Miss Nodbury's body, but he denies that he had anything to do with her death. Laura Thursday and Jed Thomasson give their pieces of the treasure map to Chan for safekeeping, after which Jimmy finds the rest of the pirate disguise as well as another portion of the map in Steve Daniels' cabin. Steve protests that he is being framed, and it is then discovered that the two pieces of the map in Chan's possession have been stolen. 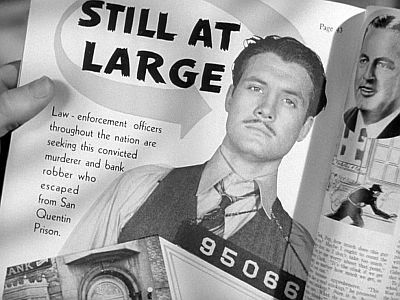 The group then finds Kate, who had fainted after reading in a magazine that Lydig is really an escaped murderer. Before Lydig can be questioned, however, he is found dead of suffocation inside of a diving bell below deck. Chan then goes ashore to find Captain Kane, who states that he has not met any of the passengers yet. When Chan questions the captain about his strange behavior, Kane explains that many years ago, he had gone on a treasure hunt to Cocos Island with a partner, but that the man had stranded him there, leaving him to die. Believing that this former partner would not be able to resist returning to the island to seek out the treasure, Kane had arranged for and publicized the journey so that he could find and kill the man who had tried to kill him. After Chan calls the police, Inspector Vesey arrives and arrests Daniels because of the circumstantial evidence against him. Chan, who has the map piece that was found in Daniels' cabin, uses himself as bait to catch the killer. Chan, accompanied on the dock by La Farge, is stalked by the person who is dressed as Black Hook. Jimmy, who was supposed to signal his pop at the approach of danger, has difficulty doing so, as he has fallen into the water. Confronted by the killer, Chan unmasks him, revealing the face of Jed Thomasson, who explains that it was Lydig who had stolen the pieces of the map from Chan, and that he had killed him to get them. As Thomasson is about to kill the detective and La Farge, he is overcome by Captain Kane who reveals that it was Thomasson who had been his partner who had left him for dead on Cocos Island. Inspector Vesey and the police arrive, arresting Thomasson and taking him away. The film ends with Jimmy once again falling into the bay as he had throughout the picture. An amused Charlie Chan tells his number two son, "Honolulu directly west." NOTES: According to Hollywood Reporter news items, Jean Rogers was to have appeared in this film as Laura Thursday, but was replaced after shooting began by Katherine Aldridge when she became ill with the flu. Hollywood Reporter production charts include Faye Helm in the cast, but her participation in the completed film has not been confirmed. Desire for ocean adventure is ailment very much like hives - give itch to many boys. Man has learned much who has learned how to die. Method sometimes hide in madness of practical joke. Man with ear to keyhole betray excessive curiosity. Investigation best way to find answer. (Miss Nodbury: "Are you looking for someone here?") Yes. Number two son who have become number one problem child. (Jimmy: "You're not going to swallow that story, are you?") Swallow much, but digest little. (Jimmy: "You had your pocket picked on this ship?") Have not been on other ship! (Steve Daniels: "Who's hollering?") Inimitable lung power of number two son. (Inspector Vesey: "The kid's got a head on his shoulders.") Very good news, if true. (Jimmy: "Maybe you ought to lend me your gun, too.") Bullet from killer much easier to take than bullet from number two son. 'Dead Men Tell' is a standard entry in the Charlie Chan series, carrying familiar ingredients of a couple of murders and a mystery over four portions of a map of buried treasure. It's a programmer that will get by as supporting fare in the houses where the Oriental detective built up a following with his crime deductions. A schooner outfitted for a treasure hunt is the locale of Charlie's latest adventure. There's a murder of the trip's proponent, the arrival of Chan and the usual list of suspects among members of the crew and expedition, until Chan finally sets the trap for the real culprit. No. 2 son weaves in and out to assist the audience in tabbing the wrong suspect. In order to set background of eerie situations, old schooner used is tabbed as a seagoing museum with old time relics aboard to give Chan a chance at weird settings for his wanderings aboard. Yarn sticks close to the Chan formula, but drags in too many suspects for general credulity. The picture is a 'Grand Hotel' aboard the docked ship, and played close to the shore - with the four-piece map another familiar piece of story construction. 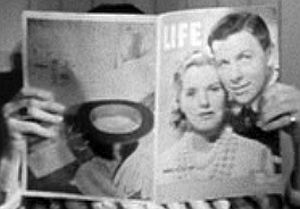 THE TIME, ACCORDING TO THE SHIP'S BELL OF THE SUVA STAR, AT THE BEGINNING OF THE FILM: 7:30 p.m. ACCORDING TO CAPTAIN KANE, WHEN THE SUVA STAR WAS TO SET SAIL FOR COCOS ISLAND: "We've gotta sail in the morning." CAPTAIN KANE'S "OLD SUPERSTITION" IN HIS OWN WORDS: "...I never meet my passengers until we're clear of port..."
IN CHARLIE CHAN'S WORDS, HIS CURRENT POSITION: "Am Lieutenant Chan of Honolulu Police." ACCORDING TO CHARLIE CHAN, THE CLUES THAT POINTED TO SON JIMMY BEING ABOARD THE SUVA STAR: "...advertisement of treasure cruise plus missing toothbrush and pajamas..."
THE TIME, ACCORDING TO THE SHIP'S BELL, AS CHARLIE CHAN LEFT MISS NODBURY: 8 p.m. WHEN, ACCORDING TO WHAT CHARLIE CHAN HAD HEARD, BILL LYDIG HAD BEEN "CALLED TO (HIS) ANCESTORS": "...six months ago." BILL LYDIG'S DUBIOUS EXPLANATION TO CHARLIE CHAN, THE NAME OF HIS BROTHER, ALSO A REPORTER FOR THE SAME PAPER, WHO HAD DIED: "That was my brother Phil - Phil Lydig." THE NAME OF THE SAILORS' CAFE LOCATED NEAR THE SUVA STAR: "Jim and Eddie's Place"
THE NAME OF THE PENNY ARCADE VIEWING MACHINE AT THE SAILORS' BAR: "The 'IT' Girl"
THE NAME ON THE SIGN NEAR THE REAR DOOR OF THE SAILORS' CAFE: "BARTEL"
GENE LA FARGE'S PSYCHOLOGICAL PROBLEM, ACCORDING TO DR. BONNEY: "He suffers from an anxiety neuosis and a fear of facing unpleasant situations. His impulse is to always run away from trouble." ACCORDING TO THE SHIP'S BELL, THE TIME AS CHARLIE CHAN DISCOVERS THAT THE TREASURE MAP PIECES HAVE BEEN TAKEN FROM HIS COAT POCKET: 9:30 p.m. ACCORDING TO THE SHIP'S BELL, THE TIME AS JIMMY CHAN "WALKS THE PLANK": 10:30 p.m. THE TEXT OF THE SIGN AT THE END OF THE PLANK: "ORIGINAL PIRATE PLANK"
THE WORDING OF THE SIGN ON THE OUTSIDE WALL OF THE BUILDING ON THE WHARF WHERE CAPTAIN KANE'S OFFICE WAS LOCATED: "SAIL LOFT"
THE TREASURE SOUGHT BY CAPTAIN KANE AND HIS ONE-TIME PARTNER THAT HAD ONCE LED THEM TO COCOS ISLAND: "The Treasure of Peru"
ACCORDING TO CAPTAIN KANE, THE MARKERS LEFT BY "BLACK HOOK" ON COCOS ISLAND: "Human skulls buried in the sand." ACCORDING TO THE SHIP'S BELL, THE TIME AS THE POLICE ALLOW THE ASSEMBLED SUSPECTS TO LEAVE THE 'SUVA STAR': 11 p.m. THE APROXIMATE TIME, BASED IN THE RINGING OF THE SHIP'S BELL OF THE SUVA STAR, AT THE END OF THE FILM: Probably after 11:30 p.m.
aft - At, in, toward, or close to the stern (rear) of a vessel. Charlie Chan: "Who occupies cabins aft?" belaying pin - A short, removable wooden or metal pin fitted in a hole in the rail of a boat and used for securing running gear. Gene La Farge: "...I saw him trying to hit this young man with a belaying pin." Woman on Pier: "60 million bucks! Boy, I didn't know there was that much dough in the whole world!" Cocos Island - A small island owned by Costa Rica. 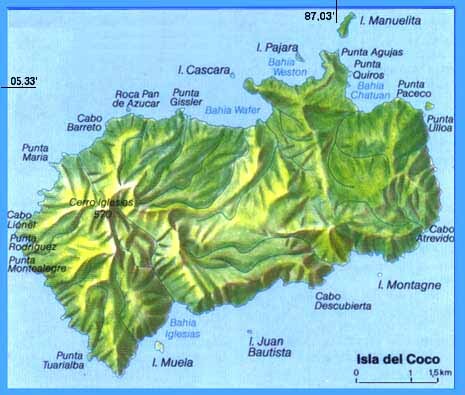 Cocos Island lies in the Pacific Ocean about 300 miles south of the Central American country. 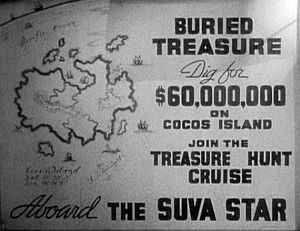 Partial text on a poster: "...Dig for $60,000,000 ON COCOS ISLAND"
fo'c's'le (forecastle) - The upper deck of a ship in front of the foremast. Charles Thursday: "[The music] seems to come from the fo'c's'le." lubber - (1) A clumsy person. (2) An inexperienced sailor: a landlubber. Jed Thomasson: "I'm an awful lubber, I don't know one line from another." numismatician (numatist) - A specialist in or a collector of coins and medals. Charlie Chan: [referring to Jed Thomasson] "Numismatician." ocarina - A small, simple wind instrument shaped like a sweet potato and usually made of terra cotta, with finger holesand a mouthpiece. Charlie Chan: "Have also heard music. Same comes from ocarina, favorite instrument of ancient pirates." real McCoy - (Informal) Authentic. Bill Lydig: "Is it the real McCoy?" Suva - The capital of Fiji, on the southeast coast of Viti Levu. It is a commercial and shipping center. Partial text on a poster: "...CRUISE Aboard THE SUVA STAR"
As viewers of "Dead Men Tell" have probably noted, the ship's bell of the sailing ship 'Suva Star' is rung with some regularity throughout the film. The bell's ringing indicated the passage of time, and, as is the case aboard ships to this day, a bell is rung each half-hour to let those aboard know the currtent time, or, more specifically, the current time of a specific watch. Aboard ship, a 24-hour day is divided into six periods of time called watches. Each watch lasts for four hours, with the first watch beginning at midnight. At the end ot the first half-hour of a particular watch, the bell is rung once ("ding"). A half-hour later, at the end of the first full hour, the bell is rung twice in succession ("ding-ding"). At the next half-hour, the sound would be: "ding-ding...ding," and so on, until, at the end of the watch, the bell rings a total of eight times: "ding-ding...ding-ding...ding-ding...ding-ding." So, with this in mind, one can tell the time as indicated by the ship's bell of the 'Suva Star' as Charlie Chan solves this murder case. At the beginning of the movie, the bell can be heard to ring seven times, which indicates that the current time, since it is nightime, is either 7:30 p.m. or 11:30 p.m. Given the activity on and around the ship, we can safely say that the earlier time is correct, and we can go on from there, having an idea as to the time as the film progresses toward its conclusion, at around 11:30 that night! Yes, Cocos Island is an actual place! This small island is owned by Costa Rica, and lies in the Pacific Ocean about 300 miles south of the Central American country. 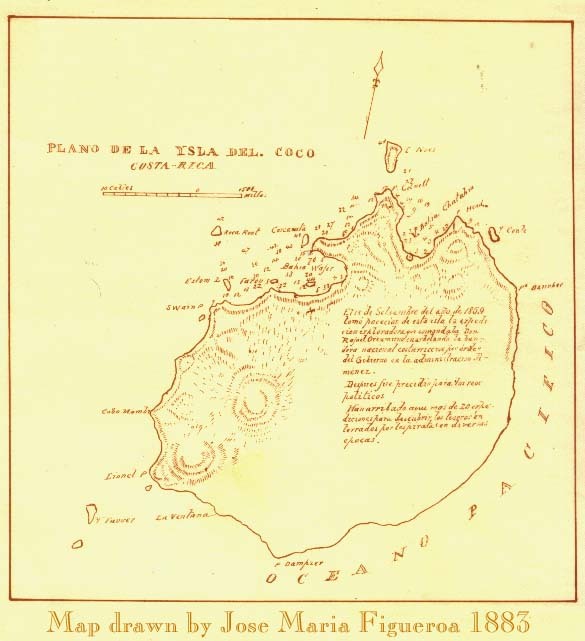 Over the centuries, Cocos Island has seen its share of pirates and buried treasure.